Quality of Life, Science, Why Minute Movement? 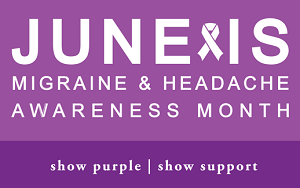 June is national Migraine & Headache Awareness Month (which I just realized late yesterday). Since I am one of the 37 million Americans (including children and teenagers) affected by this, sometimes debilitating, condition I thought it only appropriate that I share some information with you today. I am counted among the 70% of migraineurs with a family history – my mother, sister, and aunt all suffer from migraines – and I just hope that it eases up for me later in life like it did for my mom. Migraines have many symptoms in addition to (or instead of) head pain; such as sensitivity to light, sound and smells, nausea, visual, motor and cognitive disturbances, fatigue, food cravings, and mood changes. Symptoms can last from four to 72-plus hours and often have different stages which can change over the course of a migraineur’s lifetime (changes in how you experience migraine can be quite frightening). Migraine triggers can also change over the course of time (or from attack to attack) and are often difficult to pinpoint. Sitting next to someone wearing strong perfume can set me off for days and I can’t visit my favorite candle shop because they make the (scented) candles on site. Weather changes, hormonal changes, food sensitivities, and stress are just a few common trigger – which are often cumulative making it even more difficult to determine just how to stay healthy. Even healthcare providers tend to experience difficulty when helping their migraine prone patients. This complex neurological condition that less than 0.08% of the National Institute of Health budget and even though more than 100 treatments are being used for migraine prevention – none were developed specifically for that purpose. All of which is frustrating and sometimes devastating for sufferers and their families. Lost wages, inability to meet social obligations and family needs can leave migraineurs feeling isolated, guilty, and depressed. One of the more discouraging results, for me, is the inability to stay active. Even if I don’t have crippling head pain I often don’t have enough energy to do even minor chores around the house and yard, let alone go for a run. * On those days – the days that I can do something, just not everything – I’ve found that Minute Movement is a great option. I can do anything for a minute! As with many health problems, physical fitness can have such a huge impact; but chronic conditions can cause a person to become firmly locked in a downward spiral (less exercise = feeling worse / feeling worse = less exercise). If you know anyone who suffers from a chronic health issue that prevents them from getting enough exercise, please have them check out Minute Movement. It could be the thing that helps them get better. *Boy I am SO lucky to have such a supportive family! Are you tired of the same old resolutions? I have a Google alert set up to send articles about fitness every day and have noticed an interesting (but maybe not surprising) pattern. The majority of the articles I’ve received in the past few days were about how few people keep the fitness resolutions they make at the beginning of the year and ways to combat that problem. Several gyms are offering intense 21-day programs to help their clients develop the habit of using their gym membership, others offer a fitness challenge, and still others offer free classes for a few weeks. All of these can certainly help a person who wants to get in shape, the question is, ‘How sustainable are they?’. Unfortunately, far too often the answer is, ‘Not very’. Those intense programs can have you seeing results, if you’re following an equally intense nutrition regime. And challenges can be fun. But with anything extremely intense, time consuming, and restrictive you’ll eventually encounter burn-out. If you find that hour-long exercise sessions at your local gym are leaving you too sore and pressed for time, it’s likely that you’ll just stop going. A lot of people do. Now I’m not suggesting that a gym membership is a bad thing, in fact it’s wonderful to get a good, hard workout that leaves you feeling spent and exhilarated at the same time. But if you’re finding it difficult to get to the gym every day or if you’re finding that you sit in a chair all day (which can actually negate that gym time) you should really give Minute Movement a try. Minute Movement is not a short term ‘quick fix’ that will leave you burned out and lacking confidence in yourself because you gave up. Minute Movement is a simple, systematic, and sustainable (long term) solution that will help you meet your fitness goals so that this time next year you can find something else to make a New Years Resolution about.